National Invasive Species Awareness Week (NISAW) is February 25th through March 2nd, 2019. In recognition, the Osceola Board of County Commissioners issued a Proclamation at their February 18th meeting. In addition, NISAW events and workshops will occur throughout the state. Visit www.floridainvasives.org for the full list of activities. National Invasive Species Awareness Week (NISAW) is February 25 – March 2, 2019. An invasive species is a plant or animal that does not originate from its current location and causes environmental, economic, or social harm. In other words, they damage the environment, cost us a lot of money, and can impact our health and wellbeing – a dangerous triple threat. Invasive plants spread really quickly. In fact, some can double in less than 2 weeks! Without control, they can cover acres of land and water. As they grow and spread, they crowd out native plants. Native plants are plants that are originally from this area. When our diverse native plant communities die, wildlife can struggle to find a proper place to live and eat. It’s a serious issue, but there are simple things we can all do to help. The majority of invasive species were first introduced by humans. To make sure you aren’t responsible for introducing the next big invader, don’t transport plants to other areas. Also, never dump houseplants or aquariums into the environment. Many of the invasives taking over our waterbodies were once a plant in someone’s aquarium. We can also make little changes to limit the spread of invasives that are already here. Unintentionally, we give invasive plants free taxi rides to new locations. They have tricky ways in which they attach to us and our belongings. They go for a ride and fall off at a new location. Always check your boat, vehicles, and other equipment and remove any plants before leaving an area. Also check your boots and clothes for seeds. Look closely, they can be so small that they fit in the tread of your boots! Help remove coral ardisia (pictured) and air potato at the March 2nd Osceola Weed Wrangle at Shingle Creek Regional Park and Peghorn Nature Park. 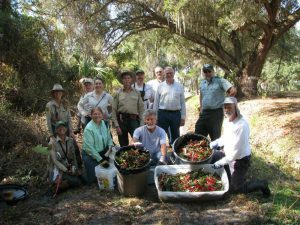 Join us in celebrating NISAW at an Osceola Weed Wrangle on Saturday March 2nd. Together, we will remove invasive species threatening our local parks. The Weed Wrangle will be stationed at two locations: Peghorn Nature Park in St. Cloud and Shingle Creek Regional Park in Kissimmee. Pick your favorite location and meet us out there on Saturday March 2nd at 9:00am. For exact locations and information visit tinyurl.com/weedwranglepeghorn or tinyurl.com/weedwrangleshingle. This will be a great learning and volunteer opportunity. No experience necessary! Help the fight against invasive plants by adding native plants to your yard. Attend the Trees Osceola program for a free tree! Native tree options will be available. While there, you’ll learn how to properly plant and care for your new tree. The program will be on March 16th at Osceola Heritage Park in Kissimmee and March 30th in Poinciana at the Mary Jane Arrington Gym and Aquatic Center. The program will be in Spanish and English and occur 3 times throughout the day: 10am, 12pm, and 3pm. Visit https://ocagriculture.eventbrite.com for more information and to register. For more information about invasive plants or any of the above events, contact UF/IFAS Extension at 321-697-3000 or email Krista Stump at stumpk@ufl.edu.